Spending 3 hours a day in Mr. Gilliam's Machine Trades class. 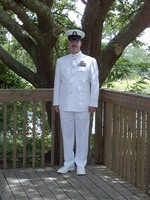 I retire from the Navy after 20 years of service in July 2009. I am finishing my Master's Degree in Industrial Management as we speak. I am looking forward to settling down with my family and starting a new chapter of life. "Nice talk Russ, think your Mom will buy it?" We've been married 18 years but only by the grace of God. The best advice I ever received came from my grandfather right before he married us when he said, "never go to bed mad at one another"...and it still holds true to this day. Who talked me into wearing that....seriously? December 2008...everyone including the dog and cat!